The so-called "shadow inventory" is known to be a major drag on the US housing prices. It is composed of homes in which the owner is either very delinquent on the mortgage or is in the foreclosure process. These houses usually end up in the market at depressed prices, putting downward pressure on the overall housing market. The ultimate goal is to predict the timing and the number of shadow inventory homes that will actually end up hitting the market - particularly those that become "distressed" sales. But that turns out to be quite difficult because there are multiple paths that a delinquent mortgage could take, as the diagram below demonstrates. Here are three reasons cited by Goldman as to why delinquencies don't necessarily translate into distressed liquidation of homes. 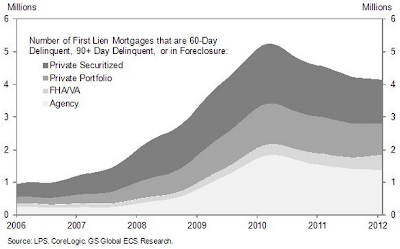 GS Research: First, many mortgages "recycle" between different performance states from month to month. For example, Lender Processing Services (LPS) data show that about 40% of foreclosure starts filed in recent months consist of "repeat foreclosures" as opposed to "new foreclosures". More than half of the monthly transitions from being current to being 30-day delinquent are from mortgages that have delinquency history during the past 12 months. Second, transitions between different performance states are heavily dependent on government policies and lender and servicer responses to such policies. For example, transitions from being delinquent to being current will increase when more loan modifications are implemented. Conversely, transitions from being current to being delinquent will decline when refinancing criteria are relaxed. 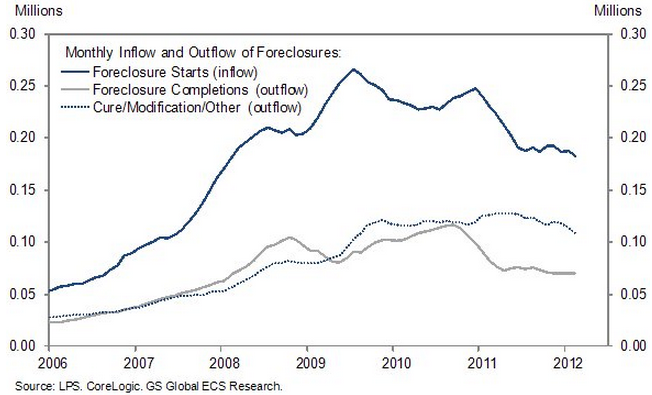 Third, not all flows out of foreclosure inventory are foreclosure completions. ... 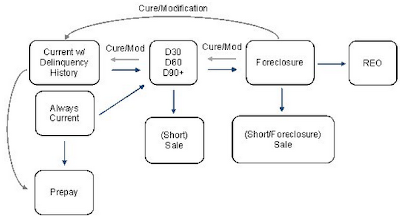 Even before the robo-signing scandal broke out and the foreclosure moratorium took effect in the fall of 2010, a mortgage was as likely to exit foreclosure via cure, modification, or other idiosyncratic reasons as via foreclosure completions. 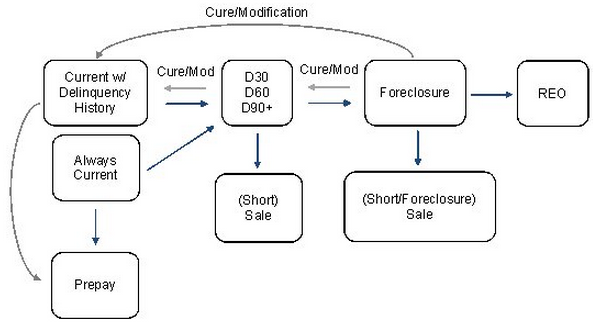 To illustrate this third point that foreclosures are not always completed via a sale, here is a chart of "foreclosure starts" compared with "foreclosure exists". 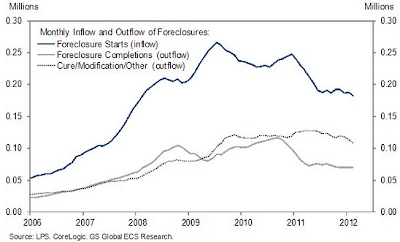 At this point less than half of the "foreclosure starts" will actually end up in foreclosure completion - and that ratio is continuing to change. On the other hand, short sales not involving foreclosure at all have become far more common, moving houses out of the shadow inventory into "visible inventory" considerably quicker than in the past. These are not "distressed" sales but simply transactions that clear the market. BW: Short sales accounted for 23.9 percent of home purchases in January, the most recent month available, compared with 19.7 percent for sales of foreclosed homes... A year earlier, 16.3 percent of transactions were short sales and 24.9 percent involved foreclosures. These effects sharply reduce the predicted numbers of actual foreclosure sales, with the timing around inventory changes becoming far more uncertain. Ultimately it makes it nearly impossible to quantify the full impact of shadow inventory on the US housing prices going forward.